I’m pretty sure I heard about this one on Google+ via the Lone Wolf Roleplaying community. So there’s not much of a story here. I’ve been investigating solo texts with a project in mind, so this was one I was eager to check out after getting several recommendations. It has a good reputation in the solo community. FAD is a solo game in which you control a party of four adventurers moving through a randomly generated dungeon. 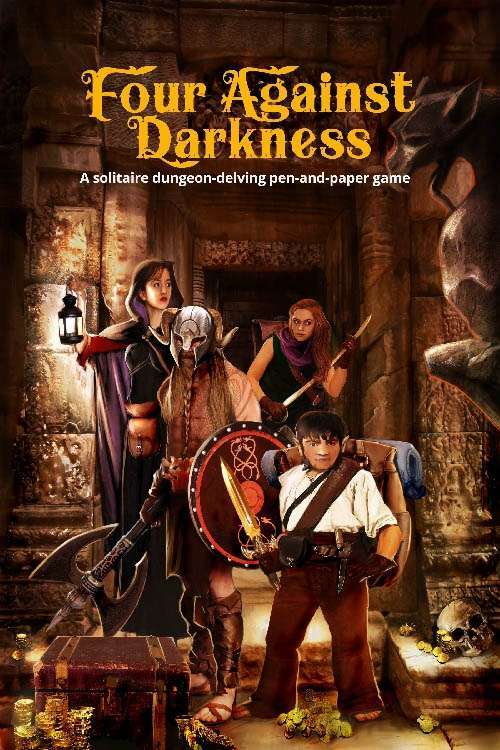 That’s not a novel concept by any means, in fact it’s got a strong traditional D&D vibe, but in my opinion it’s very well executed and fun to play. Note that while I say it’s a solo product, you could certainly play with a partner or two and just split up the characters. The book gives you advice on adding some and changing the threats to match. Also, game play has a kind of internal progression. There are vermin (nuisance monsters for which you get no XP), minions (the “meat” of the monsters), and boss monsters. You can level up on the fly and make use of stuff right away. I don’t think I saw any resting rules, but there is, of course, some healing. I played my first adventure in about 90-120 minutes, and I’ll talk about it below. First, some notes on the book itself. FAD a solid little (90 pages) book without much fluff. The PDF is bookmarked with hyperlinks. The illustrations range from good to great. The rules are mostly very clear. The flow of information seems slightly wonky to me in a few places, but nothing egregious; I didn’t really have any trouble picking everything up as I read through the first time. There are some very cool mechanics, but I’ll get to that in my play review below. I saw a few minor typos and there were a couple of tables left out of the collection at the end that would have been nice to have there (wandering monsters and search results). Other than that, I find no real flaws. You can pick it up for around $8-12 depending on current deals, but it’s well worth it. The book comes with a number of great handouts. If you are familiar with the PocketMod format, there are three sheets that you can fold into little books: a record tracker, a dungeon mapper, and a set of tables. I'm pretty sure you can play from these three books once you are familiar with the system. I pretty much mapped and explored in a counter-clockwise manner, hugging the left. While the encounter tables don't look that varied at first glance, I got a nice variety of creatures in my first play without hardly leaving the minion and vermin tables. I encountered, in order, 4 goblins, 2 giant centipedes, 2 trolls, a cursed altar, a puzzle room, 3 orcs (wandering), 4 hobgoblins, a chimera! (boss), 6 rats, a dart trap, 8 fungi folk, 5 orcs, and 1 giant centipede (wandering, on my way out). I fought everything, no bribes. Very few things ran away (one on a moral check and one immediately when I waited to see the reaction). The mapping seemed easy, though I took a few liberties with rooms (as the text suggests). I left because the wizard was out of spells and the rogue was low on life points. The wizard was the superstar, primarily because he found a wand of sleep (3 uses), had a prepared sleep, and took a second fireball when he leveled up. I think the chimera would have been a TPK without the sleep spell. The rules say sleep doesn’t affect dragons and some other creatures. There was nothing in the chimera stat block about it, but I gave it a hi-lo roll and determined he was affected. As I played, I really wished I had access to a printer to print out a copy of the book, or at least the tables, because I was flipping back and forth a lot on my iPad. (I was in a hotel with an iPad only.) I will try playing from the cheat sheets soon and update this report. I think I forgot a few things but I feel confident I mostly played it to the rules. I didn’t use the locked door rule yet or the "RPG-Lite" option. And I only searched rooms a few times. I say that because there are some REALLY cool mechanics associated with searching. I enjoyed it quite a bit and will play it again. After one play, I had three L2 and one L1 character. I played again on the same night as above, exploring a loop of rooms that took about 45 minutes. I ended up with three L2 and one L3 character and about 20 gp per person. I got a few repeats on the monster tables (hobgobs, gobs), but also some new stuff (an ogre, vampire bats). Still fun! Will play again tonight. Ouch. TPK. Walked into a Medusa who immediately petrified three of the party. The rogue used her ring of teleportation to flicker out, but then came back in to fight the monster. With one wound left, she made the Medusa break and run. Now if she could just get out of the dungeon without ... in the very last room on the way out some rats appeared (wandering monsters). The rogue decided to chance it to see if they would run, since there were seven of them. Nope. They attacked and the third rat took her life. And that was the end of my first adventuring party. Three runs. Two L2s and two L3s. I can't wait to kit out a new group.